It's often the case that parents want to track the location of their children, but what about children of separated families who want to know where their parents are? When families divide it's a very stressful and upsetting time for children, and their true needs are often overlooked by parents who think they know what's best for their child, when actually they are really focusing on just their own battles and needs. Talking with children on their level uncovers some very basic desires. "I'd like to know how to phone you"
"I'd like to know where you are"
ParentTrackTM allows parents to give their children aged 3+ the ability to track them, and find them easily in the real world. If for whatever reason your child gets lost, they are able to show the authorities where you are so that you can be reunited, without them needing to remember their home address or your name. ParentTrackTM costs £18 per year and gives you the peace of mind that your child can find you whenever they want to. There are no additional fees to pay us; you and your children can use the service as much or as little as you like, disable and enable as many times as you like. Before going to bed, or while at school, your child can quickly see where you are, and reassure themselves that you are out their. It doesn't matter how far away your are, to them you are close at heart and on the map in front of them. ParentTrackTM basically tracks the location of your mobile phone, BUT NOT using standard mobile phone operator signal strength and mast information. The accuracy of such systems depend on mobile phone mast density, and which network provider you are with - FORGET THAT! ParentTrackTM uses the GPS receiver built-in to many mobile phone handsets as standard these days to get your location to around 10 metres; making it possible to actually find you in the real world. The system reports your last known location, and how long ago it has been since seeing you. ParentTrackTM is typically accurate to around 10 metres, but it does depend on how much sky you can see, and the type of mobile phone that you have. Outdoors and on foot, 2 metre accuracy can be achieved with some devices. 10 metres may sound like a lot, but when you have a real-time feed shown on your mobile phone screen finding the person is easy. Should you want to "hide" at any time you can very quickly disable ParentTrackTM using your mobile phone, without mobile network coverage or incurring any additional costs. ParentTrackTM achieves its accuracy by using your mobile phones built-in GPS receiver and its access to the mobile phone network. You must have a mobile phone with GPS receiver and internet connectivity in order to report your location to the ParentTrackTM secure servers. It works in all countries provided that you have mobile phone network connectivity. Children wanting to find your location can do so using any internet enabled PC, no matter how old it is. If they want to find you quickly and easily while you are on the move they would need a mobile phone with internet access so that a real-time feed of your location is shown in the palm of their hand. If you would like to know more about ParentTrackTM please don't hesitate to give us a call on 07003 400 332. 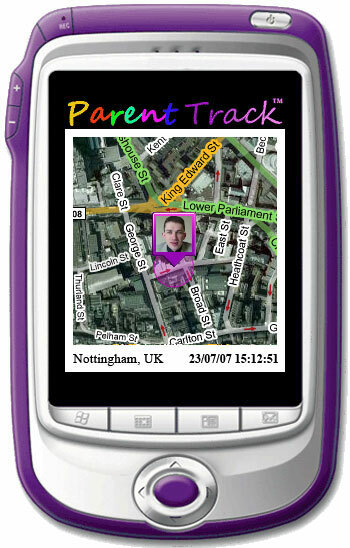 ParentTrackTM makes your location available in real-time to your child via PC web-browser or internet enabled mobile phone. So you have no idea where you left your mobile phone. ParentTrack will tell you if it's at home, work, your car, the shops, or whereabouts on your Sunday trail; even if the battery runs out! "You failed to turn up to collect the children...." your ex claims! The ParentTrack logs can show where you were and at what time - priceless independent location verification. Tell your ex you have ParentTrack and stop such games in their tracks.